The Platteville Library Foundation would like to thank everyone who supported the "Our Library, Our Future" campaign in 2016. Thanks to you, we are over halfway to our $500,000 goal to provide furnishings, fixtures, equipment and technology for the new library building! We still need your help. Please consider making your donation online, in person, or by mail to P.O. Box 358, Platteville, WI. 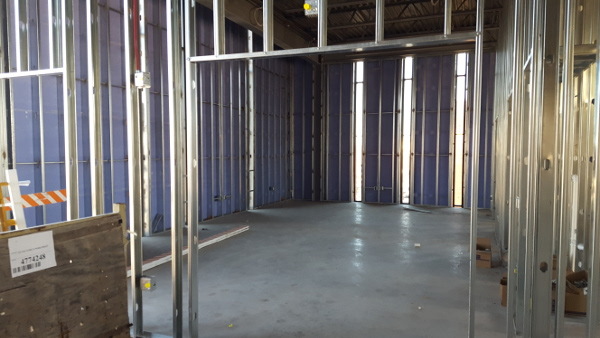 Building update: The Library Board and staff were able to tour the construction site in January. 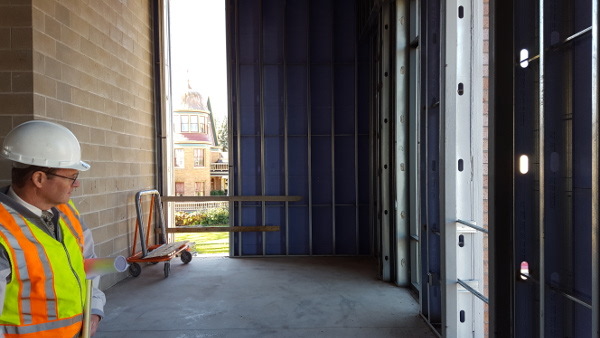 The crews are currently working on drywall, while library staff is finalizing the IT plan. City staff are beginning to plan for landscaping and the library staff is working on a timeline for our big move. Bring home something to share your bed with on those long winter nights - a new favorite book! 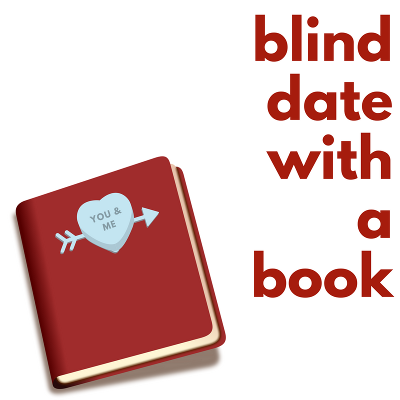 Our popular "Blind Date with a Book" returns to the library this February. Browse our center display and check out a new book to spice up your winter reading. A book about a character who doesn’t look like you or live like you. Diversity comes in many forms: race, religion, gender, geography, sexual orientation, class, ability, and more. From science to sports, history to hang gliding, ornithology to oenology - there's a book about it at the library. This might be a chapter book, a graphic novel, a book in verse, a picture book, non-fiction book, or a hybrid book. Then stop by the library, write the title of your book on our "Reading Without Walls" poster, and pick up a prize - your choice of a button or sticker. It's that easy. All ages can join in. This program will run February 1 - March 31. Dine out nights at Benvenuto's are back! Eat at Benvenuto's on the second Sunday of the month, mention the library, and a portion of your bill will go to the Platteville Library Foundation. Upcoming dates are February 12, March 12, and April 9. 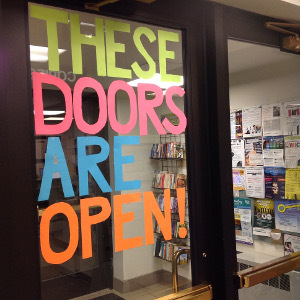 Have you seen -- our doors leading to the library / First English Lutheran Church parking lot are open once again! If you couldn't tell from the giant sign, we're just a tiny bit excited. Learn how to embrace and even enjoy dreary Wisconsin winters with wisdom from the happiest countries on earth: Norway and Denmark. We'll enjoy hot cocoa, Scandinavian fairy tales, and talk about the philosophies of koselig (from Norway) and hygge (from Denmark). In 1942, President Roosevelt signed an executive order that evacuated 120,000 Japanese-Americans from their homes. Norm Yamada's parents and grandparents were among those relocated to internment camps. Mr. Yamada will speak about his family's experiences during WWII. Norm Yamada grew up in Platteville and is a 1967 PHS graduate. If you are over 50 and would like a ride to this program, call the Platteville Senior Center at 348-9934. We provide Peeps, a box, glue, paper, markers, scissors, and 2 hours. You use Peeps to create a diorama of a scene from a book. 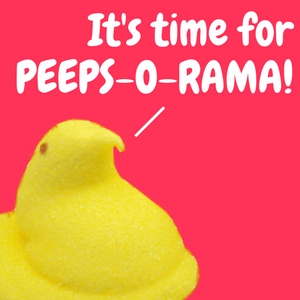 Everybody votes to pick the top three Peep-le's Choice award-winning dioramas. Call 348-7441 ext 4 to register for a time slot. Teams and individuals welcome. Read 250 pages by February 24, and you can earn a voucher for a free child's ticket to the March 31st or April 2nd Milwaukee Bucks home games (ticket is valid with the purchase of accompanying adult ticket). Stop by the children's desk to pick up your reading record and get more information. Friday Fun Days is a weekly, interactive program geared for children ages 3-6 and an adult. There will be stories, songs, games and other activities. There is no registration for Friday Fun Days. Friday Fun Days are held Fridays from 10:00 – 10:30 am, February 10 – March 31. Join special guest presenters UWP Platteville Early Childhood Association for Valentine stories and crafts. Join special guest presenters UWP Circle K for spring stories and crafts. All ages are invited to drop in and be creative with LEGO and other building blocks. Children 6 and under must be with an adult. It's an after-dark PJ party at the library! Build a blanket fort, eat snacks, and enjoy stories. Registration is required, call 348-7441 ext 3 to sign up. Use the library’s craft supplies and fancy scissors to make a handmade Valentine’s Day (or Galentine’s Day!) card for someone special in your life. Drop in program, no registration. Drop in and enjoy a calming afternoon of coloring. Coloring books and coloring supplies are provided, or feel free to bring your own. Each month we try something new that we found on Pinterest. 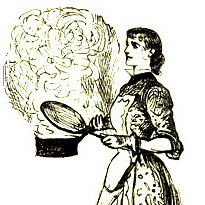 In February, we're celebrating Laura Ingalls Wilder's 150th birthday by cooking up some pioneer treats. 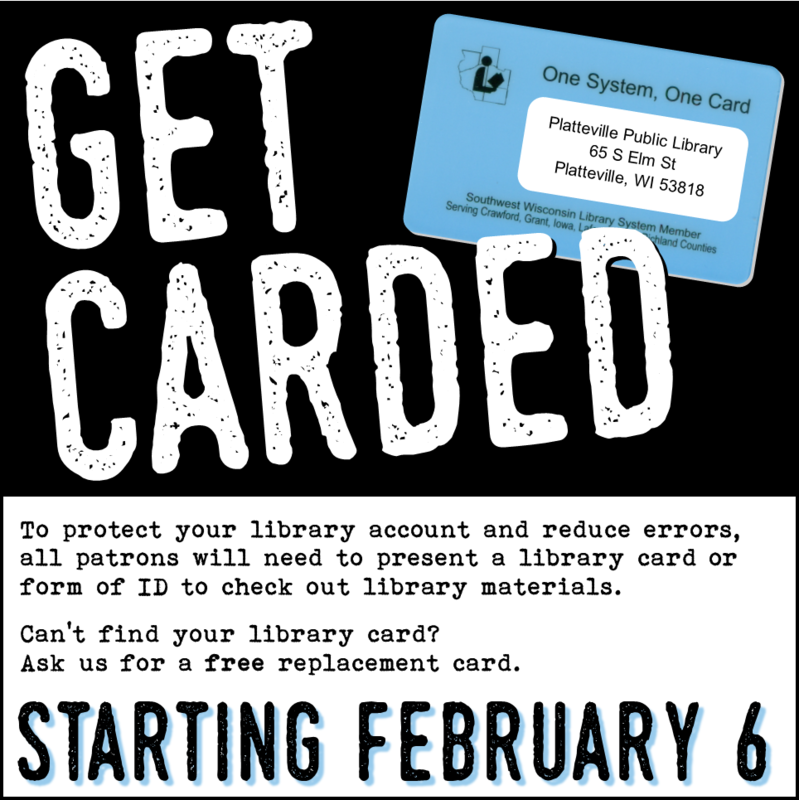 Call us at 348-7441 ext 4 or stop by the library to sign up. In February we’re reading Hillbilly Elegy by J D Vance, a timely memoir for anyone looking to learn more about class politics, America's Rust Belt, and the results of the recent presidential election. Pick up a copy at the circulation desk. Join the book club with no assigned book. We meet at Driftless Market once a month to chat about what we've been reading and give each other book recommendations. Stop by for hot tea or coffee and find your next favorite book. 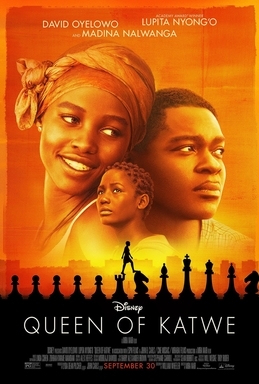 Based on the vibrant true story of a young girl from the streets of rural Uganda whose world rapidly changes when she is introduced to the game of chess, and, as a result of the support she receives from her family and community, is instilled with the confidence and determination she needs to pursue her dream of becoming an international chess champion. Movie snacks provided, or feel free to bring in your favorite film watching treat. Copyright © 2017 Platteville Public Library, All rights reserved.